Ever had a Cahn Chua Fish Baguette? Neither have we. So yay, we finally have a banh mi truck in NYC! There are at least 3 in LA, but in NYC we are only aware of a banh mi cart in the Financial District. If you don’t work downtown, you’re SOL. The Paris Sandwich Truck is fairly new to NYC, but as we told you recently, they used to sell in Jersey city, and have 2 storefronts in Chinatown. We love fish, and an authentic Vietnamese banh mi truck should make a decent fish banh mi sandwich, since fish is such a big part of their diet. Let’s find out. 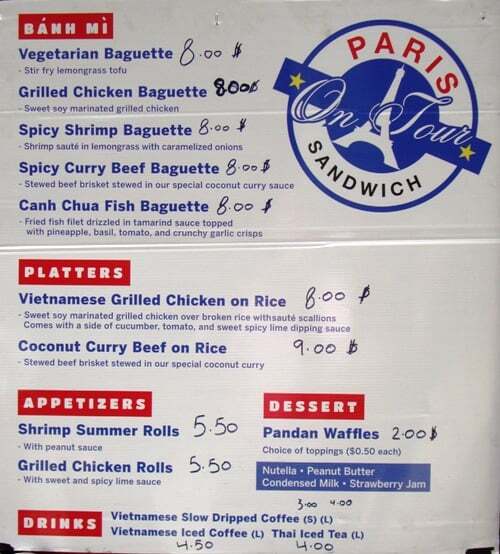 All of the Paris Sandwich banh mis cost $8. They also had spicy shrimp, coconut curry beef, and some chicken and pork items on the menu too. We weren’t sure whether to get the fish or shrimp, since we love both. That’s where the other ingredients took on more importance. The shrimp banh mi had a lemongrass sauce and the fish banh mi, or Cahn Chua Fish Baguette – had a tamarind sauce. Winner! We really enjoy tamarind sauces, and are not huge fans of lemongrass. Opening the Cahn Chua Fish Baguette to take a look, there was a well-done fried fish fillet, along with a few other ingredients. Each flavor on the banh mi was distinct: fried fish, basil and tamarind sauce were the major players, with lesser roles for the tomato and pineapple. There might have even been a little fish sauce on the sandwich too. The baguette itself was full size (about a foot long) and nice and soft, but had a little crunch to it. They also buttered the bottom of the roll. Nice first visit to the Paris Sandwich Truck. It wasn’t the most stuffed sandwich we’ve had, but there was enough for a tasty, filling lunch. That means we’ll be going back for more, especially if they continue to park around the corner from our office on Wednesdays at 55th & Broadway. Next articlePassport To Taiwan – a Cool Festival You Should Visit! Had the Grilled Chicken Banh Mi today from the truck on 6th and 52nd. Everything seemed good and the staff was pretty welcoming but halfway through the sandwich I took a big bite of undercooked chicken that was still pink so i threw the rest away. I don’t feel that sick yet but who knows. They should consider better quality control. Had the fish Banh Mi today… it was EXACTLY as described here.. The bread was nice and fresh, lightly toasted and cripsy on the outside. The taramind sauce and seasonings were very prominent and very tasty! I had them include hot sauce on the side, which was a good hot sauce that had some flavor as well as heat and it paired well with the flavors in the sandwich when used judiciously. Overall, I was satisfied, but I do wish they had doubled up on the fish portion for the price ($8). Even so, I would get it again because it was TASTY! Also, the staff was very nice, too! and dont make no sense.